It rained last night! In California that is cause for celebration. 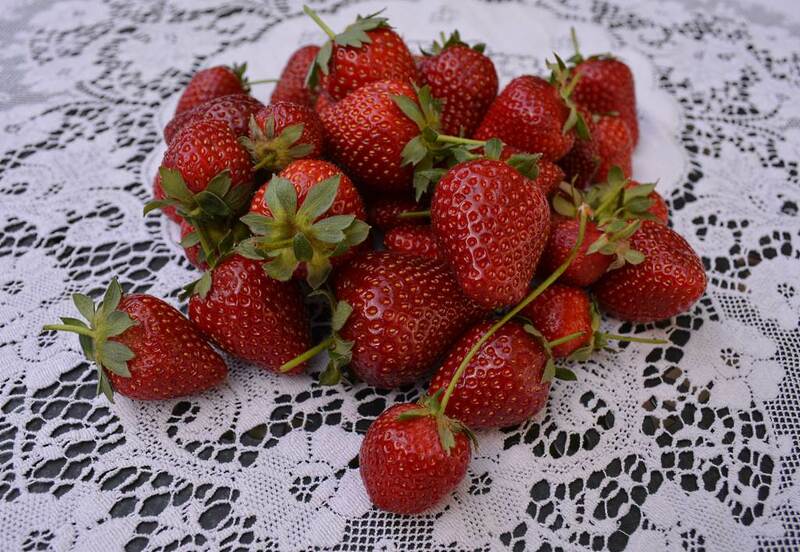 At the market today I found gorgeous Lucerno Farm’s strawberries. Tiny berries, red through and through, sweet as can be. 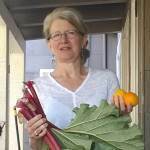 Also, rhubarb. What better way to celebrate! I’ve never been a big fan of cooked strawberries, so strawberry rhubarb pie is not my favorite. 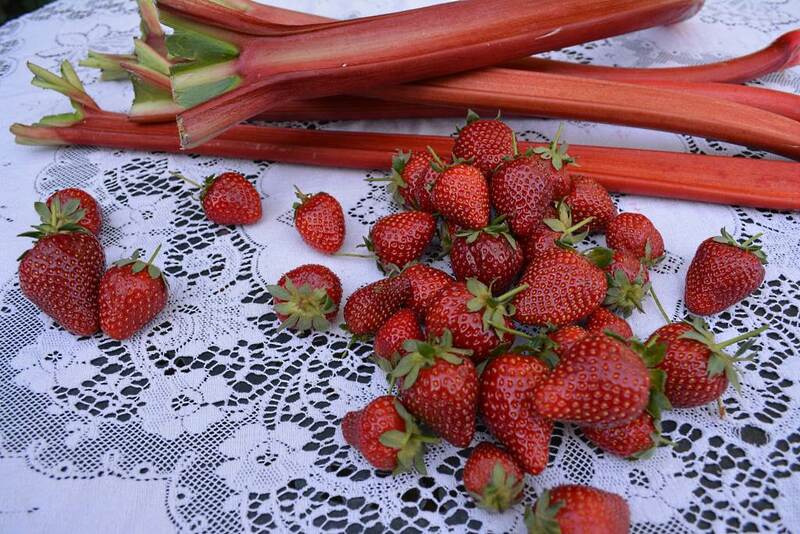 But I do love strawberry and rhubarb together. 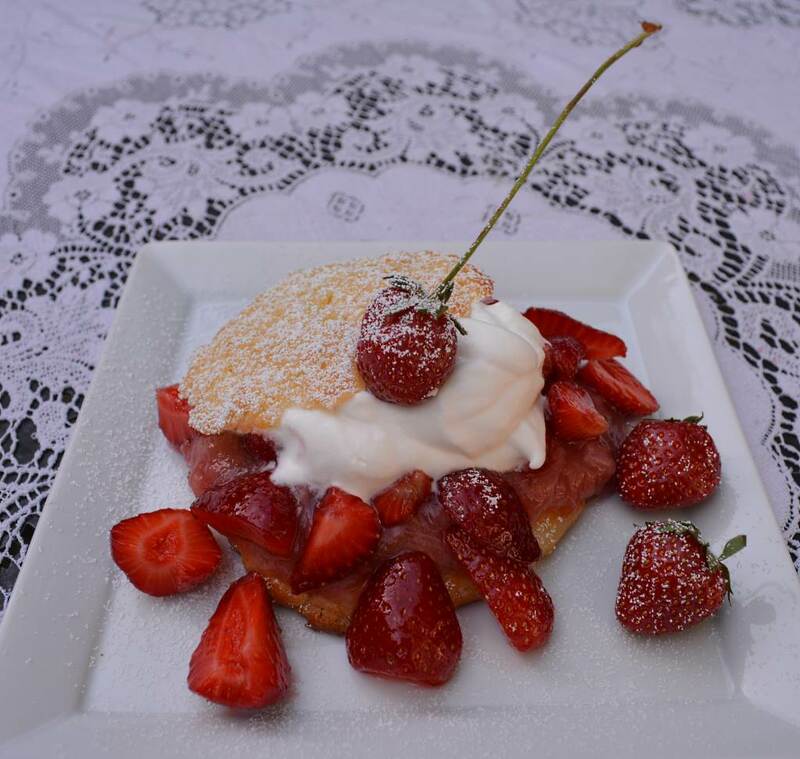 This tender cornmeal shortcake filled with a generous dollop of rhubarb sauce, lightly sweetened strawberries, and whipped cream is the best way I know how to combine these spring fruits. It is also good with vanilla ice cream or with no cream at all. 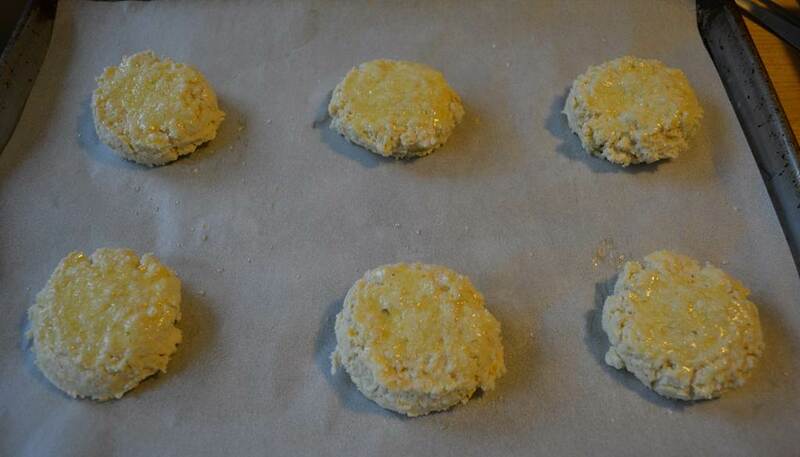 The shortcakes have some cornmeal in them, which adds depth of flavor and a little crunch. They also have the advantage of being easy to form. You don’t have to roll them out and cut them into rounds. You just scoop them with an ice cream scoop, chill them until firm, flatten slightly with the palm of your hand, egg wash and sprinkle with coarse sugar. Once baked they stay moist for a day or two, though you may want to heat them up a tad on the third day. Nothing wrong with a warm shortcake, though. The rhubarb sauce takes about ten minutes. Wash, trim, cut, cook with sugar until saucy; done. 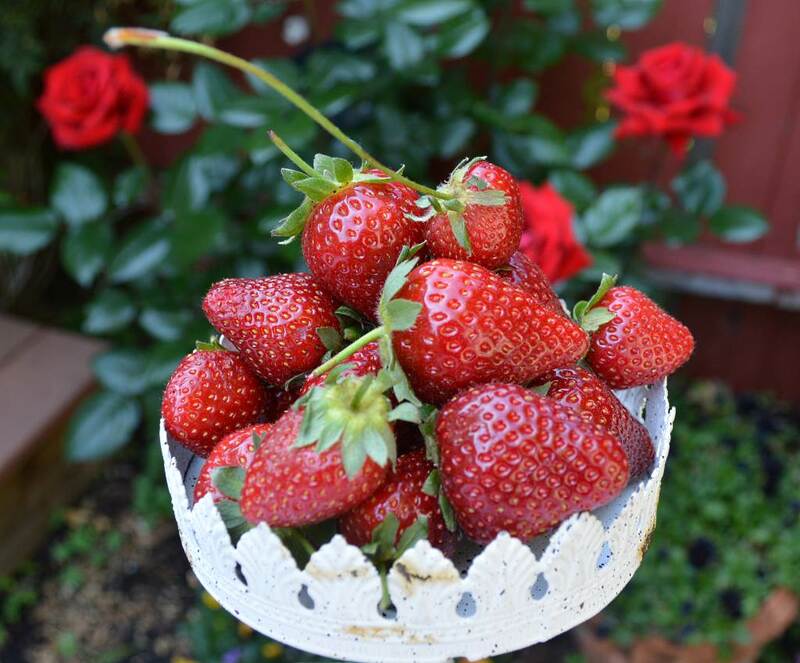 The strawberries get washed, sliced and sugared only enough to bring out their juices. The cream gets whipped until it just holds its shape. It’s only April, but even if it is still snowy where you live, you will feel like spring has sprung when you taste these cakes. 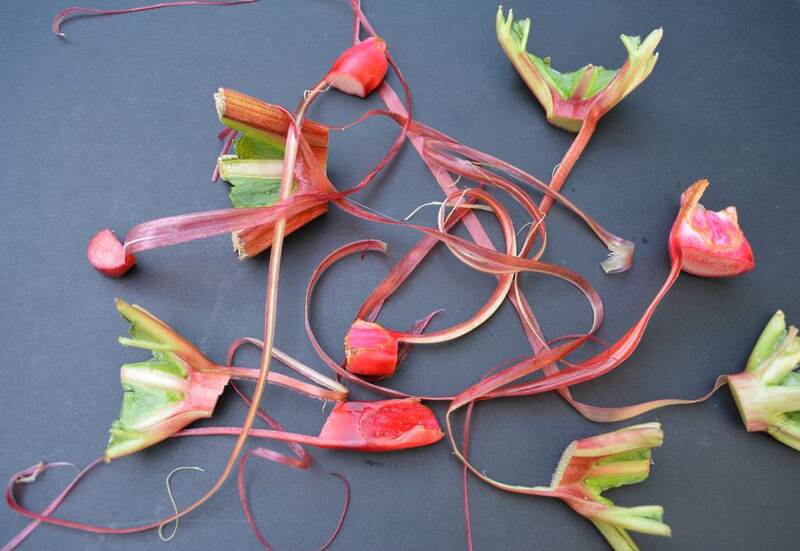 The leaves of rhubarb are poisonous, so be sure to remove them. 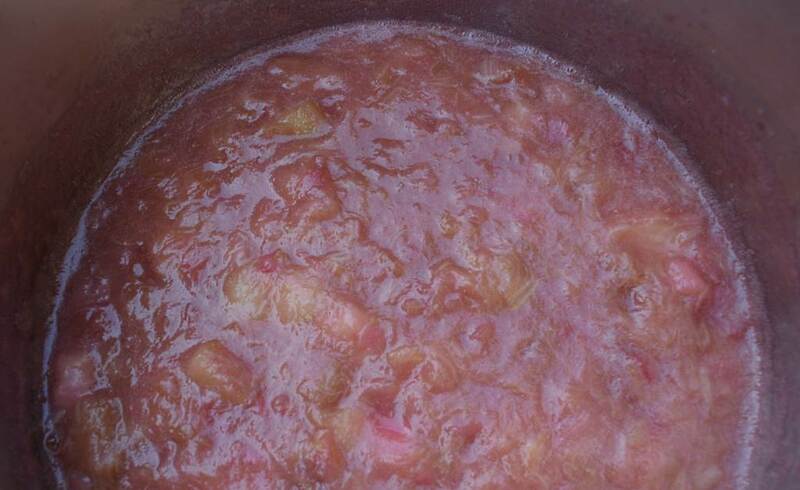 Add a couple of tablespoons of water to the pot to keep the rhubarb from burning before the juice is released. 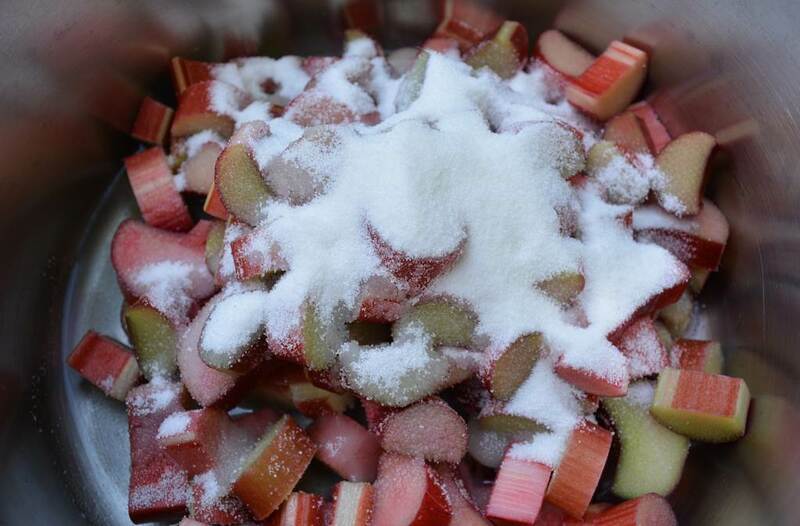 Cook the rhubarb and sugar down until it is very soft. Taste the sauce to see if it needs more sugar. You don’t need to puree the sauce. Scoop the shortcake dough with an ice cream scoop. Chill in the fridge or freezer until firm. Flatten the shortcakes with the palm of your hand. Brush the tops with egg wash and then sprinkle with coarse sugar. Measure the dry ingredients into a bowl and whisk to combine. Cut the butter into small pieces. With a pastry blender, cut the butter into the dry ingredients until it is the texture of breadcrumbs. Add the buttermilk, cream and vanilla. Stir to combine. The dough should be uniformly wet. It will firm up a bit as it sits. Scoop out the batter, with an ice cream scoop, onto parchment lined sheet pans. Chill in the fridge or freezer until firm, but not frozen. Gently flatten the shortcakes with the palm of your hand. 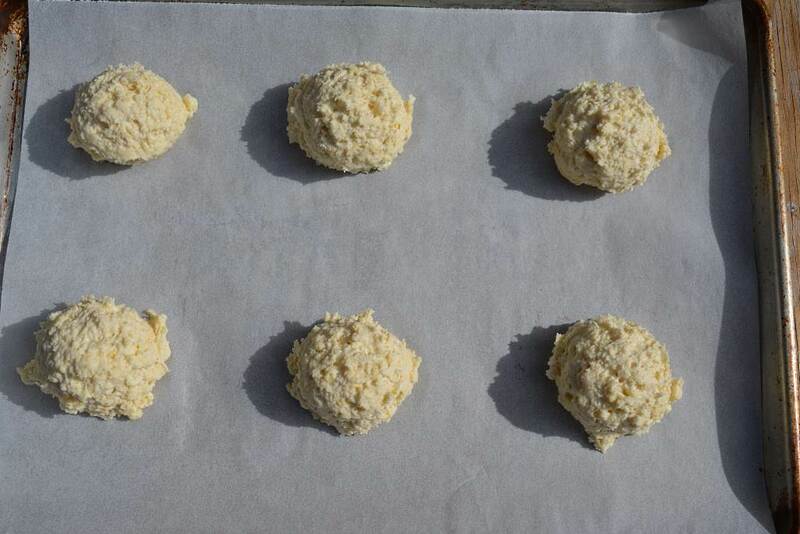 Brush the shortcakes with the egg wash and sprinkle with coarse sugar. Bake for about 20 minutes, or until light golden brown. Whip the cream with the vanilla extract and sugar until nearly, but not quite stiff. 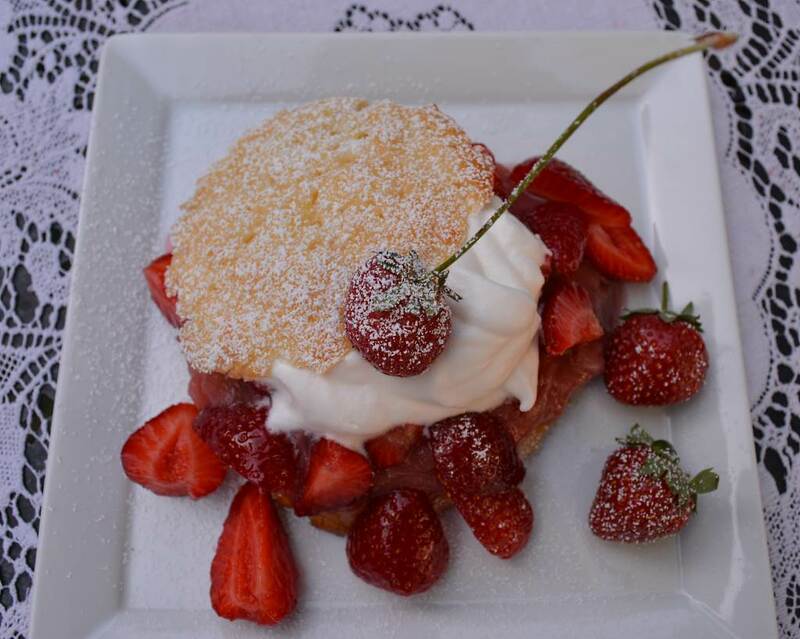 Split the shortcake in half and place it on a serving plate. 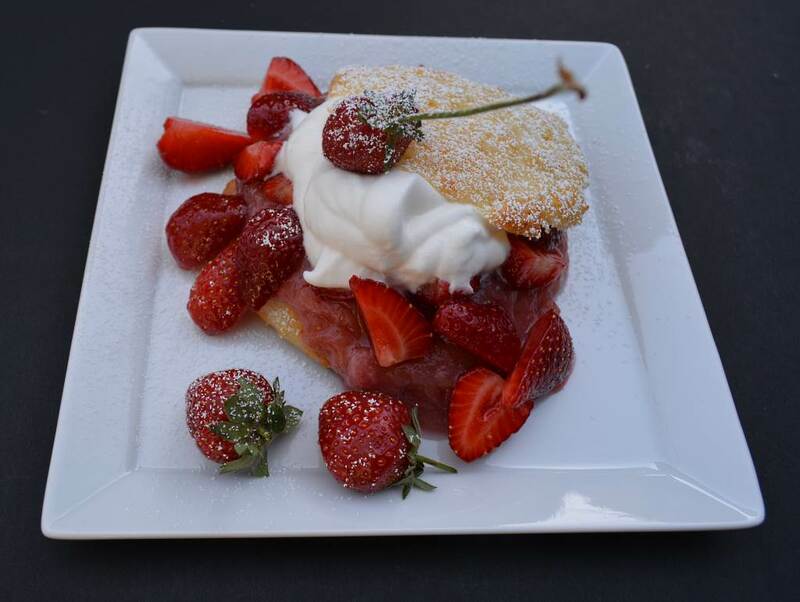 On the bottom half spoon a generous dollop of rhubarb sauce, then some sugared strawberries, some whipped cream, and then top with the other half of the shortcake. Dust with powdered sugar if desired. It looks fabulous. I can’t wait to try it. Thanks, Frances! I’m sure you can make it with your eyes closed!